In the planning since 2015, Carnival Corp unveiled the designs for their newest cruise terminal at Barcelona yesterday. It will be the second terminal the company has built and operated at Barcelona. The terminal, which is scheduled to open next year, is designed specifically to service Carnival's next generation of ships which will be fully powered by liquified natural gas (LNG). The complete story appeared in the April 28 edition of Cruise News Daily. Renderings courtesy of Carnival Corp. All rights reserved. May not be copied or used without permission. This weekend will open the Alaska cruise season at the Port of Seattle when Holland America ships begin arriving for their summer duties. It kicks off on Saturday (April 29) when Eurodam arrives for the first of 22 round trip seven-night cruises to Alaska. Princess Cruises has opened their 2018-2019 Australian programs for sale worldwide. The programs are created for the locally-sourced market, but for non-Australians they offer some more unusual itinerary options than programs by other lines that were created for Americans. Princess already announced that Majestic Princess would come south for the northern winter (Austral summer), and now Princess has detailed the rest of the four-ship program. On Wednesday, Royal Caribbean announced their 2018-2019 program for Asia and the Pacific, meaning primarily China, Singapore and Australia. At the same time they announced that their first next-generation Quantum-class ship, called the Quantum Ultra-class, will join her two sister Quantum-class ships in China in early 2019. Do you know what Thursday is? If you're Dutch or aboard a Holland America ship you knew immediately that it's Koningsdag! King's Day - the celebration of King Willem-Alexander's birthday - a national holiday when everybody goes a little crazy celebrating their national heritage. Of course Holland America, which started out as a Dutch company in 1873, celebrates decorating the ships in orange (the national color) and invites passengers to join in the celebration and sample some Dutch treats. Holland America has a new perk for suite passengers on selected itineraries that sail from five European cities or Montreal. The line is offering them a complementary two-night stay in their port of embarkation along with a special Signature Experience created for exclusively for Holland America. The offer applies for passengers embarking on 2018 sailings from Amsterdam, Barcelona, Copenhagen, Rome, Venice and Montreal. It will soon be extended to select cities in South America and Asia. The US Coast Guard suspended their search for the missing crew member from Liberty of the Seas at 12:42pm Tuesday afternoon. Details appeared in the April 25 edition of Cruise News Daily. 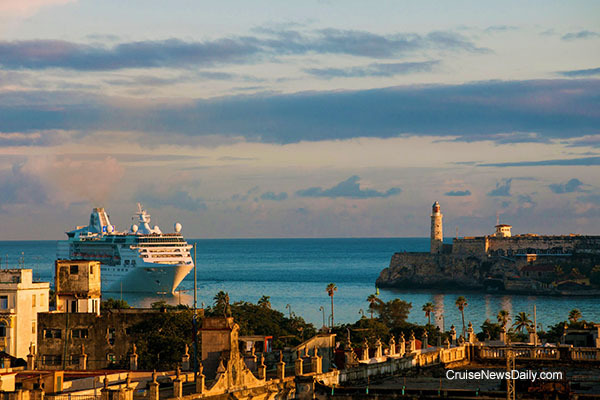 Royal Caribbean made their first visit to Cuba Sunday morning when Empress of the Seas arrived at Havana Sunday. The one-day call came as part of a five-night cruise from Miami. Overboard from Liberty of the Seas? The US Coast Guard is searching for a 39-year-old Filipino crew member who disappeared from Liberty of the Seas sometime before 4:30am this morning. Holland America Line has a new Elite Beverage Package for their customers with premium tastes. At the same time, the line also added a new lower advance purchase rate for one of their other popular packages. The US Coast Guard, a good Samaritan and our old friend, the cruise ship Zenith (one of Celebrity's first ships and currently operated by Royal Caribbean's Pullmantur brand) combined forces to rescue six people on three small boats sailing between St. Thomas and St. Croix early today.